Rob Kearney will return at fullback for Ireland’s Guinness Six Nations trip to Scotland, with Chris Farrell parachuted into the centres. 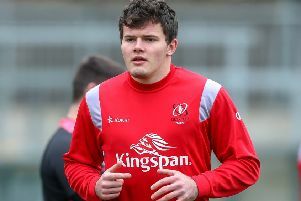 Munster powerhouse Farrell - who formerly played at Ulster - will partner Bundee Aki in midfield, with Robbie Henshaw dropping out of Ireland’s match squad due to a dead leg. British and Irish Lions centre Henshaw struggled positionally when shifted to full-back in last weekend’s 32-20 home loss to England. Stalwart full-back Kearney has been restored to the 15 shirt for Saturday’s Murrayfield encounter then, with the 32-year-old still easing back to full sharpness after a thigh injury. “Robbie has a dead leg and just hasn’t recovered in time,” said Ireland head coach Joe Schmidt. “It does make it difficult; the problem is he maybe could have played. Potent Munster midfielder Farrell has struggled with a series of knee injuries since his last Test appearance, a man of the match showing in Ireland’s 37-27 Six Nations victory over Wales in February 2018. The 25-year-old may have just three caps to his name but Ireland rate his physical presence and capacity for industry very highly. “You’ve got Chris Farrell sitting in the wings, massively motivated to do his best,” said Schmidt. “So it’s a great opportunity to get him in and give him a run. Connacht’s Quinn Roux will replace Devin Toner to partner James Ryan at lock. Toner’s ankle injury has exacerbated the absences at lock of Iain Henderson with a finger problem and Tadhg Beirne with knee trouble. Ireland: R Kearney (Leinster), K Earls, C Farrell (both Munster), B Aki (Connacht), J Stockdale (Ulster), J Sexton (Leinster), C Murray (Munster), C Healy (Leinster), R Best (Ulster, capt), T Furlong, J Ryan (both Leinster), Q Roux (Connacht), P O’Mahony (Munster), S O’Brien, J Conan (both Leinster). Replacements: S Cronin (Leinster), D Kilcoyne (Munster), A Porter (Leinster), U Dillane (Connacht), J Van Der Flier (Leinster), J Cooney (Ulster), J Carbery (Munster), J Larmour (Leinster).